This page will hopefully help you through the minefield of some of the weird and wonderful ingredients used in Japanese cooking. Many of these can be found in your local supermarket. Where possible, for some of the more unusual items, I will try to provide alternatives. If you have a Chinese supermarket nearby, many stock Japanese ingredients as well as Chinese and some ingredients cross over anyway. Don’t be afraid of Chinese/ Japanese supermarkets! It can be quite intimidating the first time you venture into these treasure troves of ingredients, sauces and spices, but they are well worth a visit. My most important bit of advice is this; don’t be afraid to experiment! Some of my best creations and discoveries have come about from not being to find the right ingredient- or not liking something in an original recipe and substituting something else. Recipes are really only guidelines so feel free to add and take out anything you like- don’t like spinach? Why not add pak choi instead? So, obviously, one of the most important ingredients is the noodles themselves. 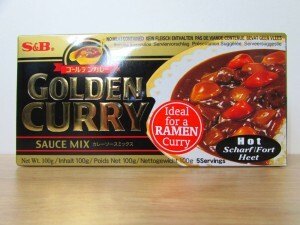 When I first started making ramen recipes I struggled to find the right noodles locally, even in oriental supermarkets. 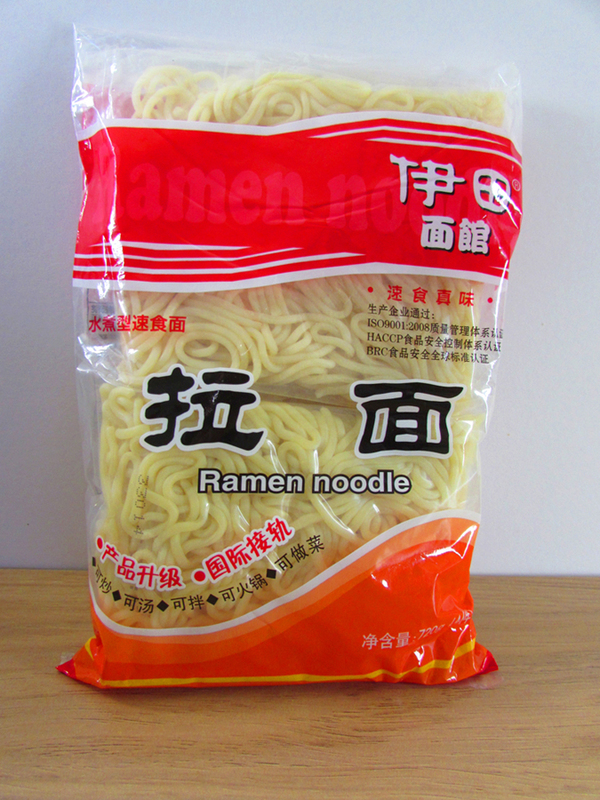 I am finding now that with ramen bars becoming more popular, these packs of noodles are now more easy. For ease of use I usually buy the vacuumed packed individually packaged fresh noodles, as these only require few minutes’ reheating before they are ready to serve (very useful when all of your rings are used up on the hob with various cooking the broth and vegetables!). These are usually found with the dried noodles in oriental supermarkets. 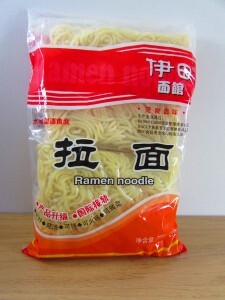 There are also dried and fresh, refrigerated noodles to be found in the oriental supermarkets. I find two of the individual packs serve two well. 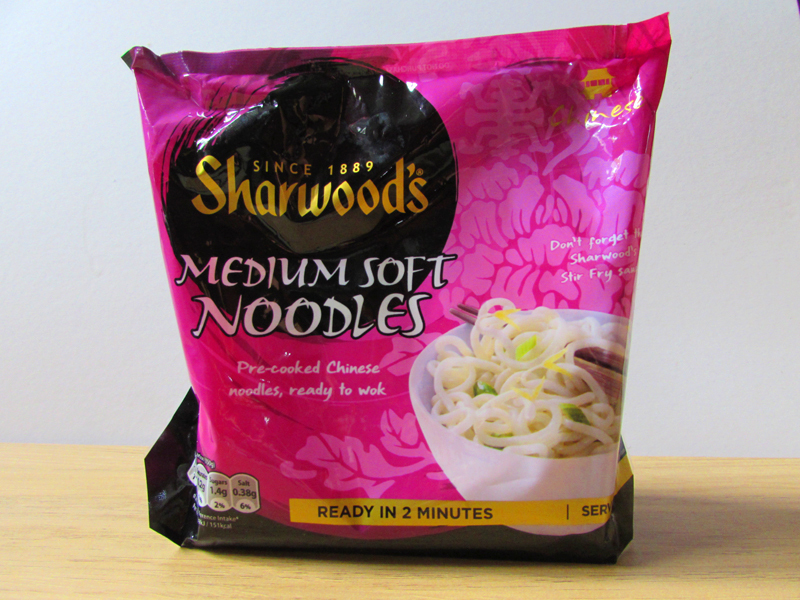 If you are struggling to find them, get some Sharwood’s Medium Soft Noodles from their ‘ready to wok’ range, as these are pretty much Japanese vacuum packed ramen noodles repackaged. If you are going to be completely authentic in making ramen, you start with making a stock, usually from pork or chicken bones- or a mixture of the two. I have experimented making my own stocks, but the process is very, very lengthy- even if using a pressure cooker. For the purposes of not spending all day in a hot kitchen sweating over a stock pot, instead I often buy good quality stock sachets from the supermarket instead. I know some will be scandalised by this, as a lot of the flavouring in ramen comes from the strength of its base, but to counterbalance this, I usually have more flavourings in the toppings. 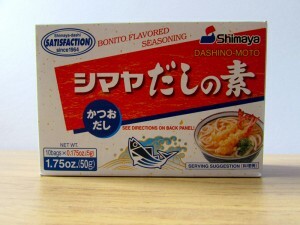 Dashi stock is made using bonito flakes (dried tuna) in a process that will make your kitchen smell of fermented fish. Instead of making your own, you can buy ready-made dashi stock sachets in Waitrose. You can also buy dashi powder, or dashi no moto from oriental supermarkets, which adds a salty umami flavour when added to stocks. 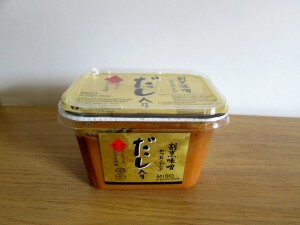 I am still trying to get my head around the many varieties of miso paste that seem to be available. I have experimented with darker and lighter misos and so far the main variation for me is that the lighter, white miso is sweeter than the darker ones. 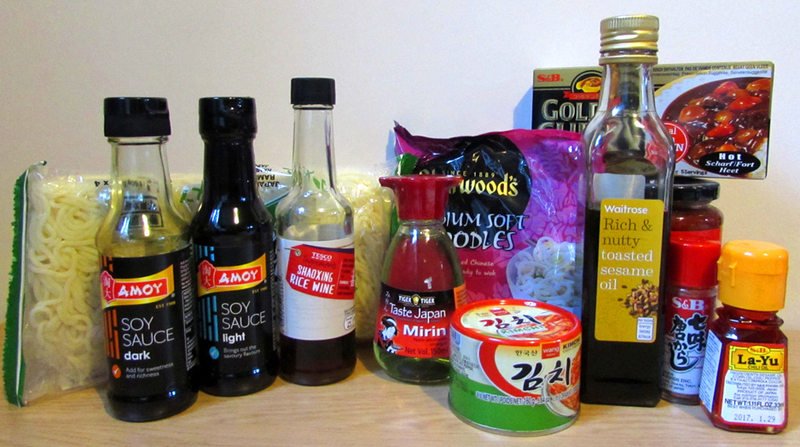 Many cookery books give names to these different sorts of miso but to be honest, I tend to use what I have in. If you are faced with a large variety, choose a middle coloured one. 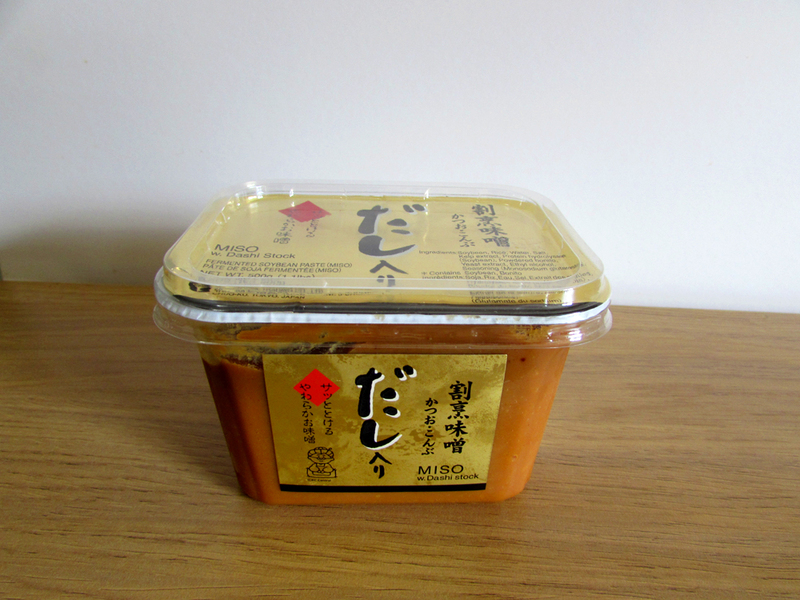 Clearspring are stocked by many Waitrose stores if you aren’t near an oriental supermarket and when I have been really stuck I have bought their miso soup sachets and used several for a miso base. The best thing to do here is to try different types until you find which makes the tastiest base for you. Soy sauce is used in many of the recipes on my blog. Japanese soy sauce differs to the Chinese light and dark soy sauces. As I cook a lot of Chinese food, most of my recipes here will use Chinese soy sauce (I usually buy Amoy brand) and will tell you when to use dark, light or both. Light soy is saltier and usually used in the cooking process in Chinese cooking, whereas dark soy sauce is generally used for flavouring at the end of cooking. Together they add a really good depth of flavour, so quite often I add a bit of each. 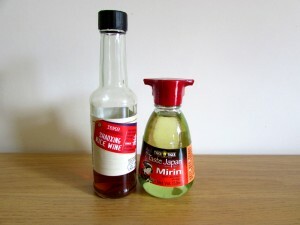 Mirin is a Japanese sweet rice wine, which is now quite widely available in the international food aisles of most supermarkets. It has a syrupy texture and adds sweetness to a dish. Japanese sake is used in many Japanese dishes, but as I find this difficult to get hold of, I usually substitute Chinese Shaoxing rice wine, which is more widely available. Shaoxing rice wine adds another layer when using delicate flavours in Japanese and Chinese cooking and is fantastic for adding flavour to meat when cooking and in marinades. If you’re really stuck substitute with a dry sherry or even a splash of white wine to dishes. A very useful sauce to keep in the fridge as it can be used in all sorts of recipes, chilli bean paste is another Chinese/ Japanese crossover. As you can see it comes in various packages and name variations. I usually buy the Lee Kum Kee brand, which you can buy in Waitrose and which is a little less intense than some thicker pastes. If you buy the Chinese paste (like the one with the red plastic lid), use it a little more sparingly. 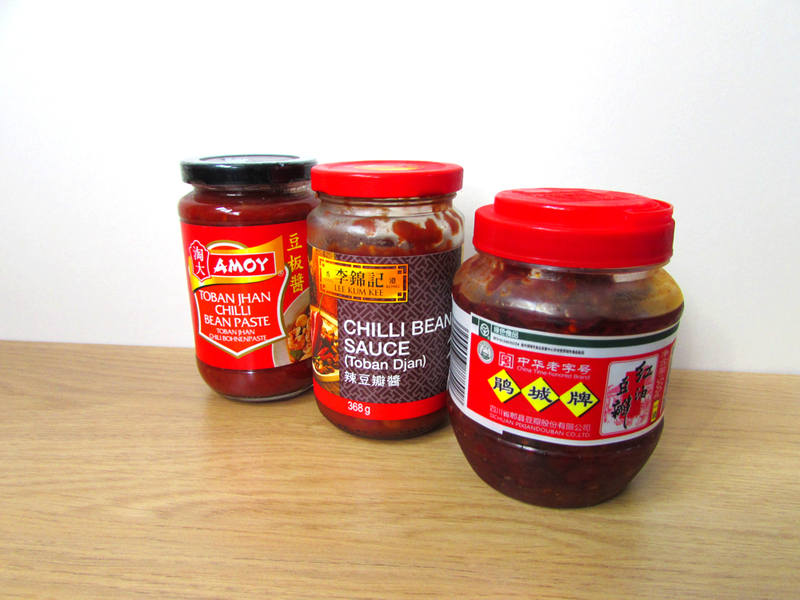 It is a mixture of chillies and fermented soy beans and is used to add a fiery, salty flavour. As a great lover of hot, spicy foods, I add this to all sorts of meals. 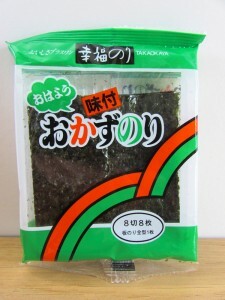 The little rectangles of nori sometimes served poking out of the side of a bowl of ramen is a sort of Japanese seaweed. It has a crunchy, salty flavour. You can buy this very cheaply in bulk in Chinese supermarkets in individual small packets, ready cut to size for ease of use. If you are struggling to find it, you can cut down large nori sheets usually used for wrapping sushi. Alternatively, Itsu’s seaweed thins are the same thing. 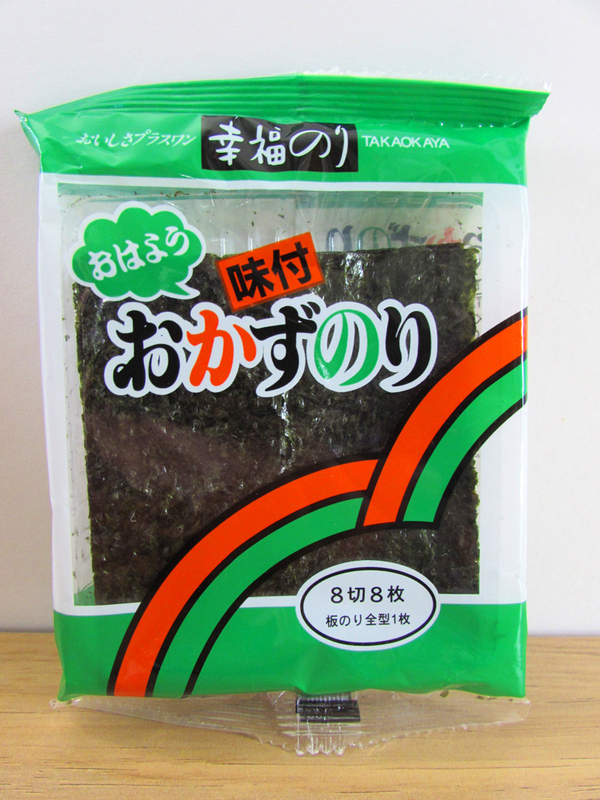 Try using the Itsu Wasabi seaweed thins, flavoured with Japanese horseradish, for aa slightly more punchy flavour. I usually prop up the nori against the side of the ramen bowl, so that one end remains crispy while the other absorbs the flavour of the broth. Beni shoga is a bright red pickled ginger with a strong, sweet flavour, used as a garnish on top of ramen dishes. I first tried this unusual pickle in Wagamama, where it was used as a noodle garnish. With a tangier, punchier flavour than pink sushi ginger, beni shoga is difficult to find, even in oriental supermarkets. 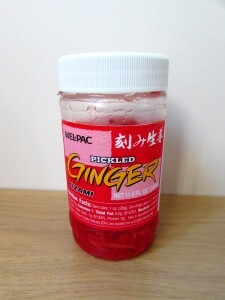 You can buy it in some of the supermarkets in London’s Chinatown and also in Japan Centre. If you can find it, it is worth its expensive price tag (about £5.00), as there is no similar substitute and its crisp, tangy flavour. I usually just fish out a forkful, tap on the side of the jar to remove the liquid and pop a little mound of it on one side of my bowl of ramen. If you like your food with a bit of a spicy kick, chilli oil and chilli powder can be sprinkled on top of your dishes. 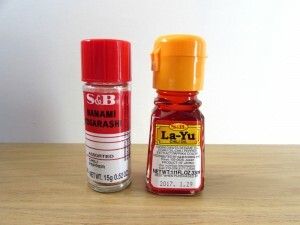 La yu is a Japanese chili oil with a sesame oil base, so it has a slightly nutty flavour. 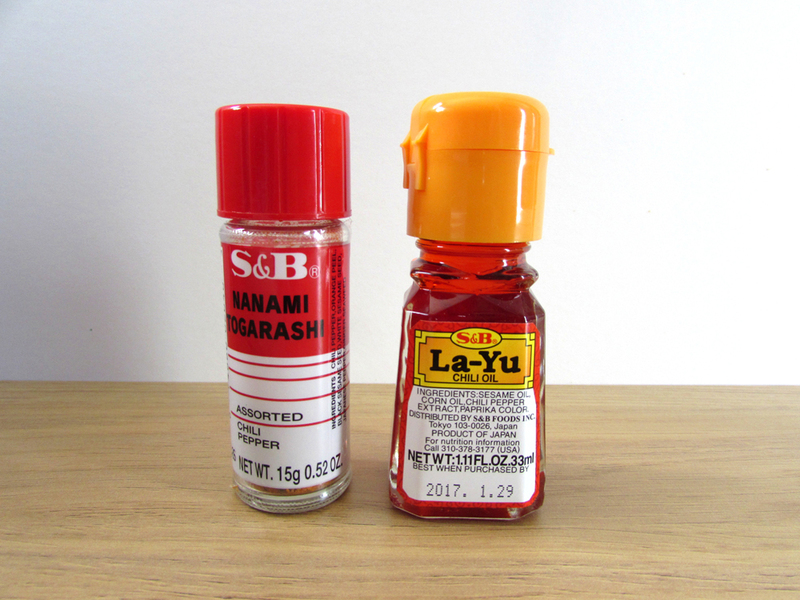 Chinese chilli oil can be used instead, for the heat without the sesame flavour. Nanami togarashi powder, a Japanese mix of chilli powder and sesame seeds, also adds a tasty heat to meals. Both can be sprinkled over your bowl of ramen before you eat. Kimchi is a Korean fermented pickled cabbage, with a salty, tangy flavour. Both the cabbage and its juice can be used to flavour broths, especially in seafood ramen that have a more delicate flavour. 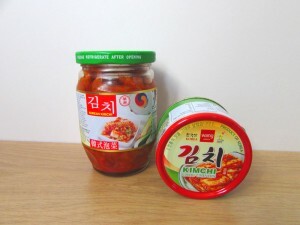 You can buy kimchi made with various vegetables, but the most usual is with Chinese leaf (napa cabbage). As well as adding to broths I sometimes pop a little straight from the jar on my ramen as a topping. Quite tasty with a bowl of plain rice as well. These curry sauce packets contain a bar of curry concentrate, which can be broken off in pieces and added to stock bases for a curried broth. 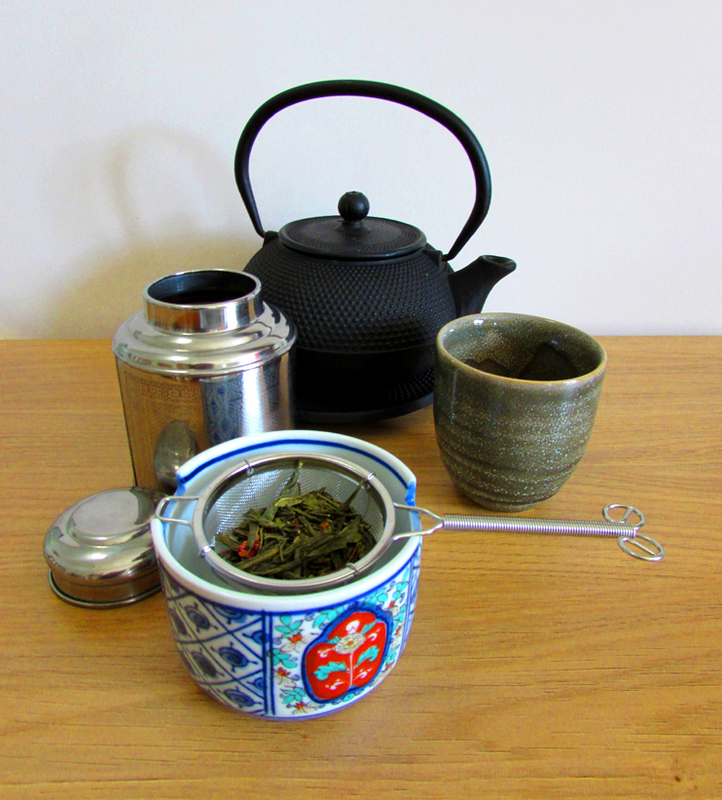 The flavour is similar to a Chinese curry and makes a great delicately flavoured curry broth. There are few new items you will need for your kitchen to cook ramen. One piece of advice, for cooking in general, is to invest in a good wok. I may raise eyebrows here when I say that my wok of choice is a John Lewis non-stick heavy bottom 28cm wok (Tefal made a very similar thermospot one). I have tried other, more traditional woks, which have only rusted or had the non-stick surface perish. This wok (I now own two) is the best investment in cookware I have ever made. I use them for everything from frying eggs, making pancakes to stir fries and slow cooking. Because of the hard non stick surface they clean extremely easily as well. I have a lid for mine which helps so that the soup base for the ramen doesn’t reduce whilst everything else is cooking. A wok is not, however, essential. A large stock pot or saucepan will work as well. To create the right ambience and tone for your Japanese meal, you might like to buy some tableware. 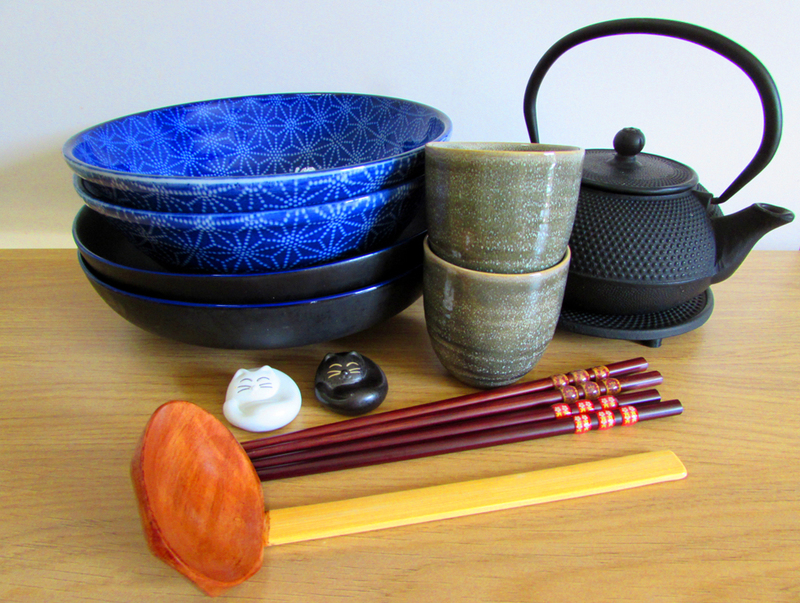 Loving Japanese and Chinese foods, I have amassed quite a collection of chopsticks, spoons and bowls. Luckily as world cuisine is becoming more and more popular, it is now quiet easily to pick up these things quite inexpensively. Ramen bowls are larger than soup bowls or rice and noodle bowls. I started off using pasta bowls, but found these were too shallow for scooping out the soup after you have eaten the noodles. The Japan Centre sell a selection of ramen bowls, but I ended up buying some Tokyo Design Studio bowls from a kitchenware shop in Rye, with a nice oriental pattern in blue and white. Essential for picking up your ramen noodles if you don’t want to resort to a fork, you can pick up chopsticks from even larger high street supermarkets now. Japanese chopsticks are slender than Chinese ones, but both do the same job. If you want something with a little more style, Tiger Stores stock a large range of patterned chopsticks. When I was in China I bought some chopstick rests as well, which are useful if you can find as they stop your table getting messy! When I first started making ramen, I was using the small Chinese ceramic spoons for ladling up the soup. I eventually invested in some proper bamboo ramen ladles, which makes eating ramen so much easier! I have not found these in an oriental supermarket and bought mine from The Japan Centre. These combined with the deeper ramen bowls makes for the perfect ramen eating experience. I will discuss in more detail about good accompaniments to ramen meals at a later point but to really set the scene for your eating experience, finishing touches such as Japanese teaware to serve some green tea and oriental patterned napkins and place mats can add the finishing touches to making a proper dining experience out of your meal. A few Japanese rice bowls can serve as containers for pickles or side dishes to accompany your ramen. I bought a lot of my tableware from John Lewis, who have a lovely black, blue and white themed oriental range, but if you hunt around online, even amazon and eBay have nice, inexpensive items.